Looking for a wonderful fall festival to visit on your travels this year? There are a number of festivals that are just a road trip away this autumn. Take a trip and enjoy the leaves turning, the delicious pumpkin pies, and the interesting crafts! According to the Travel Channel, a trip to Maine should be first on your list. October brings the Harvest on the Harbor Festival. This festival takes place in Portland, Maine, from October 22nd through October 25th. Famous Maine chefs are on tap, preparing some of the region’s best dishes, there are beer samplings, barbecues and a marketplace. This is the best time of year to see Maine’s gorgeous foliage, too. In Columbus, enjoy Oktoberfest! Rain or shine, this festival takes place in a 100,000-square-foot pavilion so it is completely covered. Enjoy beer, authentic German food, live music and dancing! The festival highlights much more than beer, so even if you do not imbibe, they have much you may enjoy. There are crafts in the marketplace (or Marktplatz), a parade, delicious foods and of course, live entertainment! Contrary to popular belief, Oktoberfest does not take place in October. Mark your calendars, and head to Columbus September 26th through September 28th. 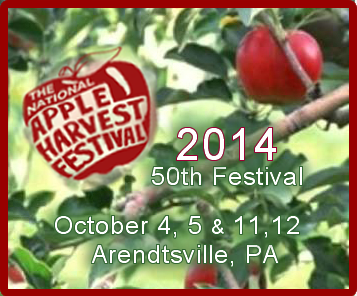 Travel and Leisure says that the National Apple Harvest Festival in Arendtsville, Pennsylvania is the place for families. They have been celebrating with the apple festival for over 44 years. The event is held during October, on two weekends. They highlight apples in a number of different ways, from apple jellies to apple sauces and candied apples. There is even an apple-bobbing contest! There are antique and classic cars on display, more than 300 vendors, musical acts, pie baking contests and an auction. The festival is also home to a tractor square dance, in which tractors ride in a formation like couples on a dance floor. Love the pumpkin? The Circleville Pumpkin Show takes place in Circleville, Ohio during October (October 17th through the 22nd). The pumpkin fest is a big deal in Circleville. In fact, kids get the days off from school to attend. There are pie eating contests, live music, stained glass demonstrations, craft tents, fashion shows and more. Finally, those who enjoy cranberries will want to head to Wisconsin the last full weekend of September (this year it is the 26th – 28th). Every September, tens of thousands of people visit for the annual Warren Cranberry Festival or Cranfest. Warren is the leading producer of cranberries in the US, and they celebrate this fact with a huge parade, tours of the cranberry marshes, the crowning of cranberry royalty, plenty of unique items for sale at the 800 arts and crafts booths, and more than 100 food booths! One of the biggest wine producing regions in Canada is the Okanagan Valley in British Columbia. For 10 days in early October you can enjoy the scenic settings amongst the lakes and mountains and celebrate the fall grape harvest. Celtic Colours boasts that it is the largest festival of its kind in North America. Cape Breton Island hosts the celebration of the Celtic culture for nine days every October. 2014 events are schedule from October 10th -18th and offers a wide range of events like concerts, dances, workshops, and community suppers. Enjoy the beautiful fall backdrop and the 18th anniversary of this festival that celebrates the rich island culture. No matter where you plan to take a road trip this fall, you are more than likely to be near a wonderful fall festival. Plan your trip now! How about SC and NC both are great in the fall. ?